Today, Gavin braved the land that time forgot behind the big shed and Strong sign to try and regain control of the bramble and weeds. This battle is long over due and is the start of the next big project at the box. 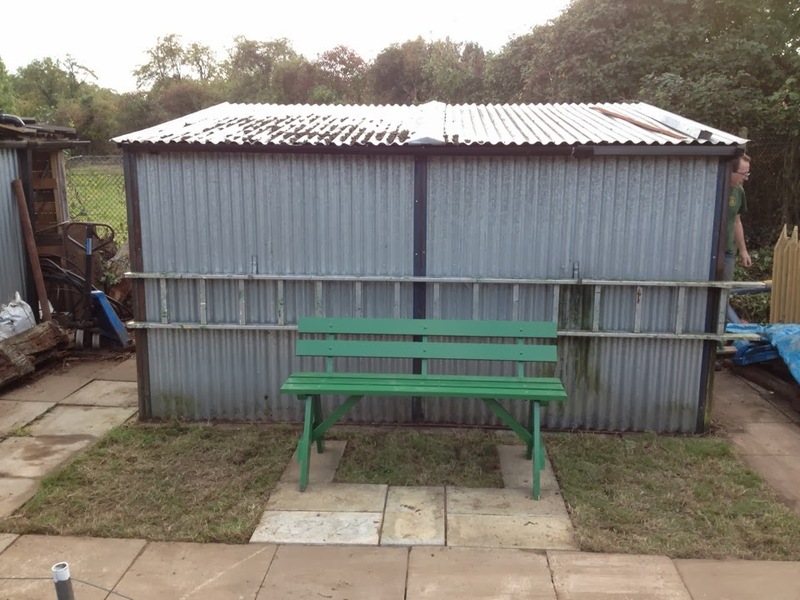 For further progress at the box the small gardening shed needs to move to the other side of the big shed. 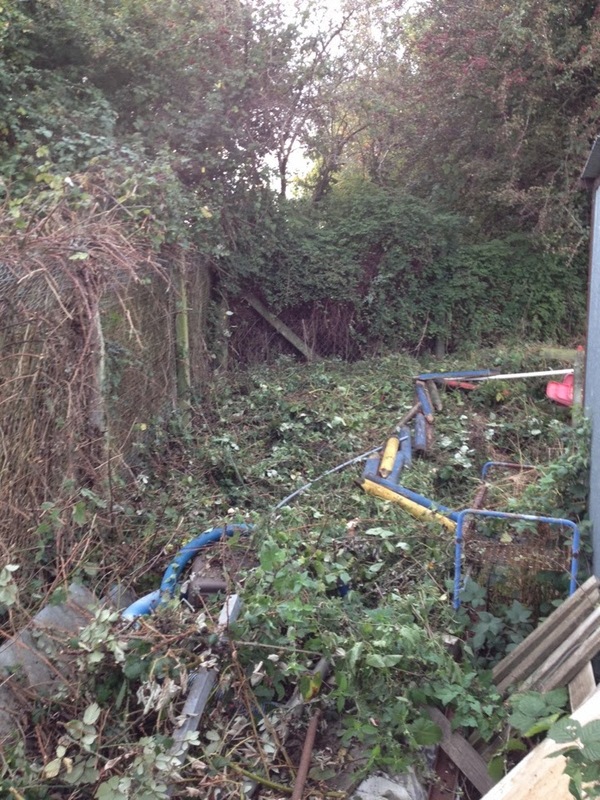 To start this project we needed to get to this section of the site, so we volunteered Gavin to take on this task. 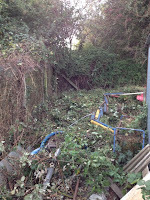 These images show just the start of the project, and next moth (weather permitting) there will be further weeding and progress on this section of forgotten land. 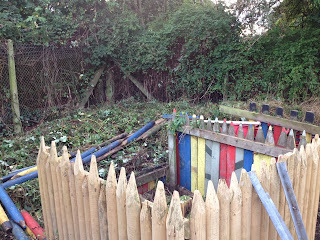 Today saw the completion of the area at the back of the site, in front of the big shed. After Dave's hard work to complete the second bench for the site, and Peters work to clear this area we felt that this undeveloped area was a great place to put the bench so that visitors can sit and look at the site from a different angle. After starting the day looking like this(on left); Gavin, Jamie and Allan (relative of a new member) started by laying the slabs, donated by Dave, in a way that would ease the user but also give space for turf. Once the ground was prepared, the slabs were put down and levelled. 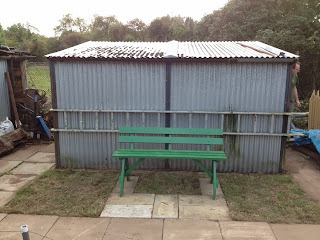 Once complete Jamie went over to the old school ground to cut squares of turf to lay round the slabs. 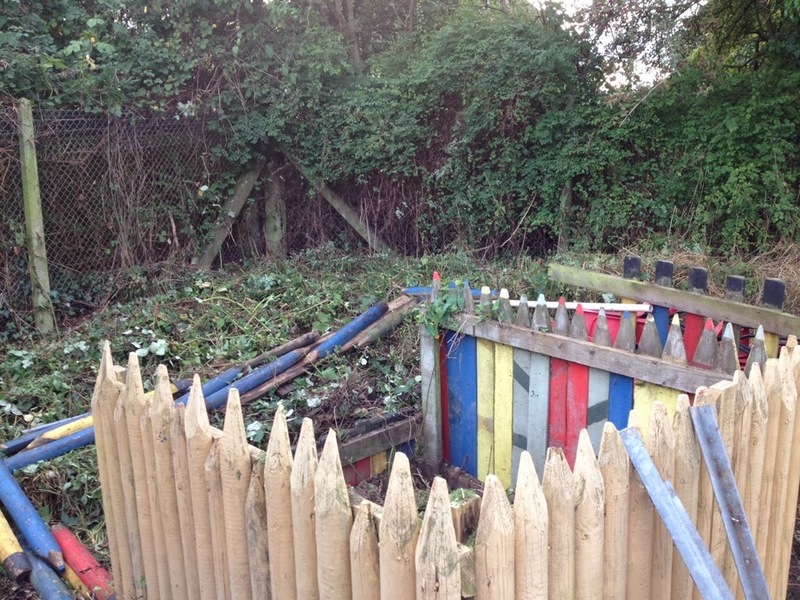 At the end of the day, the site was left looking like this(on right). The turf was watered in and has now been left to root. It may look a bit shabby at the moment, but after a couple of mows, it will fit in perfectly with the rest of the turf on the site. On a side note, Josh (new young member) and Tom (young member) started work on protecting the two trolleys built by previous young members. the job involved sanding down the surface and then protecting it with new preservative. this is a job that will ensure the onward use of the trolleys without costly repairs. All in all, another progressive open day which has improved the appearance of the site and the state of the woodwork we have at the box.